Gain the self-confidence you need to feel comfortable in your own skin with our liposuction and fat freezing treatments. At Glow Touch, in Ilford, Essex, we offer an assortment of effective treatments to help you feel totally rejuvenated. With advanced skin treatments and laser services also available, we have a variety of non-surgical options which also make you look and feel better. Cryolipolysis receives its name from the combination of two terms, cryogenic, meaning to freeze, and lipolysis, the breakdown of lipids which involves hydrolysis of triglycerides into glycerol and free fatty acids. There are two ways in which cells die, necrosis and apoptosis. Fat cells are more easily damaged by cooling than skin cells. Cryolipolysis was developed by applying low temperatures to tissue via thermal conduction. 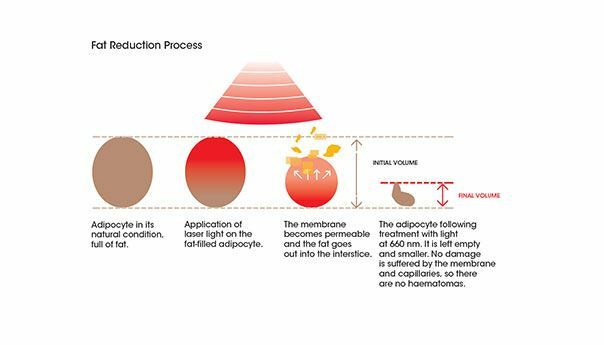 The fat cells are rich with saturated fatty acids, and are particularly sensitive to temperature reduction and freezing. Under such extreme conditions the fat cells die. Other cells such as skin tissue, blood vessels, and our nervous system are not as sensitive to freezing and are therefore unaffected by the Lipo Angel™ ICE treatment. Radio frequency therapy is used to re-tighten your body’s skin and dilated pores, while improving the appearance of cellulite by applying high-frequency electromagnetic waves. The tissue resists the frequency current which produces heat, causing a retraction of connective tissues and a stimulation of collagen cells (fibroblast). Cavitation is a biological phenomenon that consists of the formation of bubbles in between the cells which implode by the action of a low-frequency ultrasound. This creates shock waves that selectively damage the membranes of the fat cells, spilling the liquid fat into the lymphatic system and finally to the liver to be metabolised. It is scientifically proven that after a cavitation session, excess liquid or lymphatic toxins are drained from the body via your urinary system. Combining cryolipolysis with cavitation and radio frequency is highly recommended when you want to see the best results. During week four and week eight of post-cyro service, you’ll come back for two body contouring treatments of cavitation and radio frequency. Using the price guides above, the total cost of the treatment would be £594-£894. However, depending on the service of treatment, we are able to create a package deal for just £480-£750. Using a combination of advanced aesthetic procedures, the LA Lift system will lift, increase volume, rejuvenate, and tighten your skin. You’ll notice instant results that will last for up to seven days. A course of 12 treatments will provide you with a more permanent lift, often lasting for up to two years. Not only will this gentle suction system improve blood and lymph circulation, it also helps to stimulate muscles. This creates visible results with an immediate lift and in increase in volume. A safe and effective bio-electrical microcurrent stimulates the muscles with an electrical impulse. Focusing on the muscle, this is rather like a workout in a gym, causing the muscles to tighten. This in turn helps to create firmer-lifted breasts and buttocks. Using advanced photon light therapy, the LA Lift will stimulate fibroblasts to produce collagen and elastin fibres, which are the scaffolding supporting system of the skin. Then we rejuvenate the skin, helping with texture and tone to decrease the signs of ageing, fine lines, and wrinkles. It is also used to diminish the appearance of stretch marks. Vibration massage has been used for some time in lifting and tightening of the skin. The LA Lift vibration massage will stimulate blood and lymph flow which is vital to healthy tissue and cell rejuvenation. The gentle vibrations increase the lift and tone of the skin, stimulating the muscles to encourage a lifted and firmer appearance. Contact us today, in Seven Kings, Essex, to find out more about our liposuction treatments and fat freezing services.